Whether you are moving into a new home or conducting some renovation to your existing home, making way for a larger closet space is a good option because most people tend to accumulate a larger collection of items with every passing year! If you have an overflow of items, it is time to de-clutter and build a larger closet. 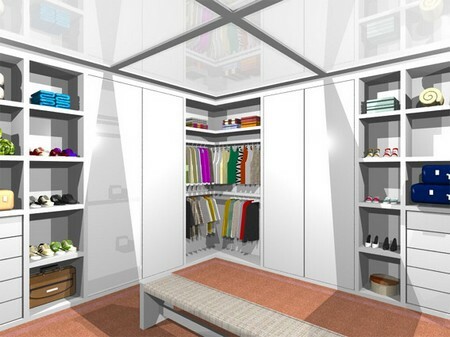 Here are some guidelines for you on how to build a closet. Firstly, decide where you want to locate the closet. It is best to build it against an existing wall in your home. You may need to clear some items to get a clearer view of the available space. Sketch the plan if necessary. Remember to consider the flow of movement in the room and location of door when you design. There are different types of storage spaces to begin with. Among them are walk-in, hanging, and wardrobe closet. This depends on type of items stored in the space. Generally, the interior consists of shelves, rods, drawers and other important accessories. The material that you choose is also important. Usually they are similar by functionality but differ by design and price. It is advisable to determine a budget and keep to it. When you have a general idea and a building plan, the next natural idea is to make a list of things to purchase. Using the building plan, measure the actual space accordingly. Make provisions for mistakes by purchasing longer or wider materials (i.e. shelving wood). Basically, you will need a drill, hammer, screwdriver, level, tape measure, and saw. Next up, you can now proceed to build the frame. A stud provides support for the space, and usually located in the middle of the wall. You can use a stud finder is necessary. Connect the organizer to the stud vertically. It is much secure that way. Place the frame in place, check level, and secure the ends using a framing gun. The following steps are to drywall the closet and install the necessary elements for the interior such as shelves and rods. Drywall involves adding finish construction to interior walls and ceilings. Last but not least, remember to paint or stain if you are using wood materials. They last longer that way. You can now add the door frame and door to your closet. Voila! You have a new closet space now. These are guidelines for you on how to build a closet. You can actually save a lot of money by building your own storage space. It is a quick and easy process if you have a proper building plan and all the necessary equipments.